A blog by Karen Murphy, International Director of JtoJ partner Facing History and Ourselves. Article originally posted by Facing History and Ourselves on their Facing Today blog. The stories are heartbreaking and chilling. In the first few weeks of 2017, identity-based hatred appears to be pervasive and on the rise. Two immigrants from India were shot in Kansas allegedly by a man who confronted them about their visa status; historical Jewish cemeteries were vandalized in St. Louis and Philadelphia; and, in Rockville, Maryland, a Jewish couple, who put up a Black Lives Matter banner outside their home, received a threatening note with the word “Jew” written in German and the ominous promise of “mayhem.” On January 29th, six people were killed and 19 were injured in a mass-shooting at a mosque in Quebec City. The victims included fathers, an academic, and local businessmen. They were in the midst of evening prayers. While the 2016 data is not out yet, 2015 was a horrific year in terms of identity-based hate. In the US alone, anti-Muslim crimes were up by 67 percent, antisemitic crimes rose by 9 percent, and anti-black crimes by 9 percent. What we do know for last year is that 1,094 bias-related incidents alone were recorded in the US between the day of the presidential election and December 16, 2016, according to the Southern Poverty Law Center. This year does not look promising thus far. One statistic already out for the US is that white supremacists have increased their recruiting on university campuses. This should give us pause. Is identity-based hatred on the rise? We don’t know yet. We do know there appears to be greater comfort in expressing it, in bringing it out of the shadows. What was unimaginable–or, more accurately, clearly unacceptable–in post WWII Germany, France, and the US, to name only a few countries, has become more commonplace. We might remind ourselves as we confront this hatred and violence that there have always been extremists, and identity-based hatred was never fully eradicated but individuals, communities, institutions, and nations working together, have created new norms, sought to protect human rights, and prevent and punish identity-based hatred and violence. The question is whether we intend to uphold those protections and remain committed to prevention. Individuals standing up and speaking out matter more than ever. We know from those who study human behavior that stories of hatred and violence can be overwhelming, inspiring “psychic numbing” and even insensitivity. We also know that people are more likely to respond to a single story. We had that in mind when we developed a collection of resources on standing up to hatred and intolerance, focusing on stories of individuals such as Izzy Lenga, a victim of vicious antisemitic attacks and an upstander who made the hatred directed at her visible to others through social media, and Siavosh Derakhti, a young Swede who has dedicated himself to addressing antisemitism and xenophobia. His commitment to these issues began early. He saw his best friend bullied for being Jewish and he noticed a general lack of knowledge about the Holocaust in school. He set out to address the bullying and the ignorance. And now Derakhti is fostering greater awareness about other forms of hatred, including Islamophobia and xenophobia. Efforts like these are vital. In a moment that feels fraught and chaotic, when democracies around the world, including that of the United States and France, feel vulnerable, flexing our civic muscles is more important than ever. It’s daily work for each and every one of us. 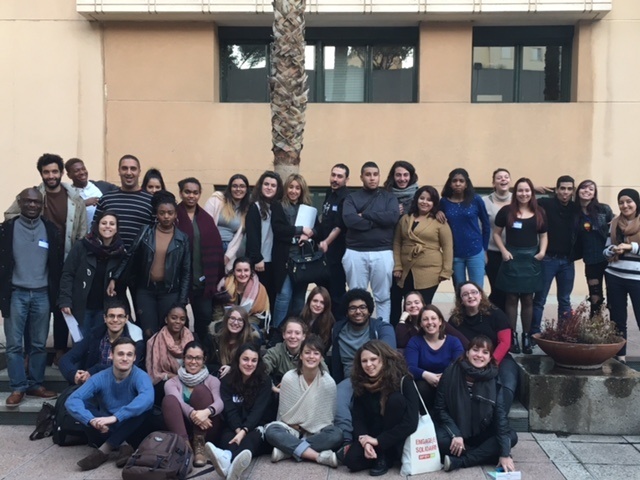 Photo Caption: Volunteers from Afev in Marseille, France working with Facing History and Ourselves.